Despite being one of the most iconic superheroes in the sprawling DC Comics universe, Wonder Woman still hasn't received the same big-screen treatment as her male counterparts like Superman, Batman, Thor, and the Green Lantern. What gives? I mean, come on...the Green Lantern? Remember how that cinematic reboot turned out? I'm still trying to forget. 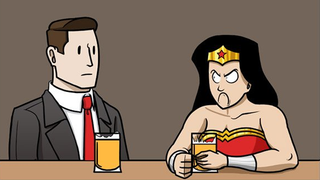 The good people at Dorkly broached the subject of Wonder Woman's suspicious absence from live-action feature films in a new comic, and it actually makes a lot of sense. See, it's just because all the suits involved in bringing capes to the big screen haven't figured out "the right angle for her." Never mind that Marvel has taken a lucrative "everything but the kitchen sink" approach to its film adaptations. Well, maybe people just aren't ready for a "superhero movie starring a warrior royal heir in ancient European history who has beautiful flowing hair." Except for, you know, that Thor guy. Check out more Dorkly comics here.